Savannah’s old-world charm draws countless visitors each year. As you walk the streets of the Historic District, you’ll come across centuries-old buildings and cobblestones that have seen generations of passersby. However, some of the old has become the new! The Lebanon Plantation, built in 1756, is still in use today. It is the producer of Verdant Kitchen™ spices. If you’re looking for historic sites to visit, check out our complimentary Vacation Guide. Inside, you’ll find everything there is to do and see in the area! The Lebanon Plantation began its construction in 1756 after the land was granted to French colonists by King George II. It was originally an experiment to see what crops could be grown, including indigo, mulberries, and rice. The plantation passed through some prominent Georgian men before ending up as the headquarters and prison for the Fifteenth Army Corps of the US Army during the Civil War. After foreclosing, it passed through a few more families before being turned into the working plantation it is today! Now, it is mainly a producer of spices. Today, the Lebanon Plantation is home to the Verdant Kitchen™ products. This local company produces spices, baked goods, candies, and more, each with a focus on the ginger and turmeric family of spices. You can find their products at farmers markets, online, and in specialty stores. The farmers at the Lebanon Plantation realized the same thing as the French colonists did more than 200 years ago; the soil is perfect for growing. The sandy soil and subtropical climate make it perfect for producing things like ginger, galangal, and turmeric. Can I Visit the Lebanon Plantation? Unfortunately, visitors are not allowed on the Lebanon Plantation at this time. If you would like to visit a plantation during your stay at Presidents’ Quarters Inn, we recommend going to the Wormsloe Historic Site. Also known as the Wormsloe Plantation, you can see tabby ruins, family burial sites, and gorgeous walking trails. There’s even a museum on-site! 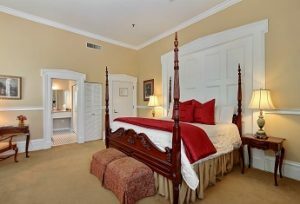 If you would like more recommendations on where to go in Savannah, Presidents’ Quarters Inn has resources for you. We are more than happy to give you a recommendation! Are you considering a getaway to Savannah, Georgia? We know just the place for you to stay! Presidents’ Quarters Inn is in the heart of the Historic District, so you will have easy access to all the incredible things to see and do in the city. Our guests are treated to the finest amenities, including a delicious breakfast, complimentary wine & cheese hour, turndown service, and more. Browse our luxurious accommodations to start planning your stay! Each room features designer linens, antique furnishings, and more. Some even have balconies overlooking the city! When you stay at Presidents’ Quarters Inn, you can be assured that everything will be taken care of. From our complimentary parking lot to our extensive lists of tours and activities, there’s nowhere else like our Savannah bed and breakfast.